The Glorious PC Gaming Race company was founded not too long ago with one mission: ‘to create unique gaming accessories, engineered for premium quality and elite-level performance, sold at everyman prices.’ That is quite a bold claim, but when our reviewer tested out their mattress sized gaming mousepad and absolutely loved it (click here to read that review) our interest was piqued. 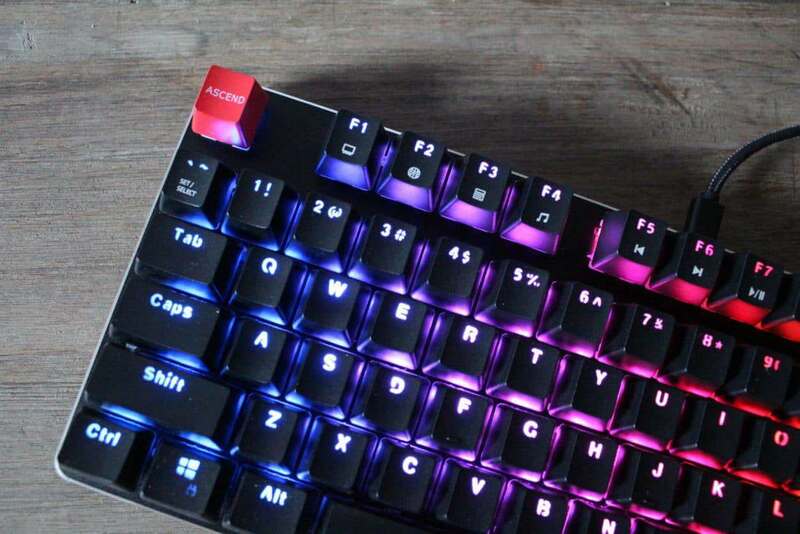 The GMMK (Glorious Modular Mechanical Keyboard) is the second product that they’ve developed, and the major standout feature of this board is the fact that all of the switches on it are easily replaceable. 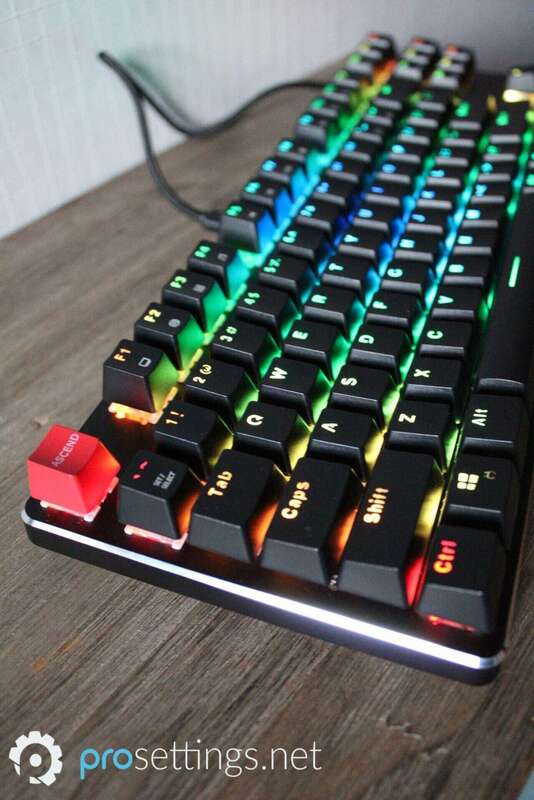 That sounds very interesting, so we got ourselves a tenkeyless GMMK (you can also buy a full size version, fyi) along with a switch sample pack and sent those over to our reviewer. Read on to see what he thought of it. The GMMK is a very clean product. The only thing that gives away that it’s a gaming keyboard is the fact that the standard escape key is replaced with a ‘launch the nukes’ style key which says ‘ascend,’ but aside from that it’s a very sleek and professional looking keyboard, with absolutely no branding anywhere (except on the bottom side of the board). The keys sit right next to the edge of the keyboard, with little to no room spared for any wasted space. The keyboard itself is finished with a polished chrome strip all around the edge, which elevates the premium, classy look of the keyboard even more. The GMMK connects to your system via a detachable Micro-USB cable, which is always an applauded design decision in my book, as detachable cables make a keyboard way more portable and mobile. 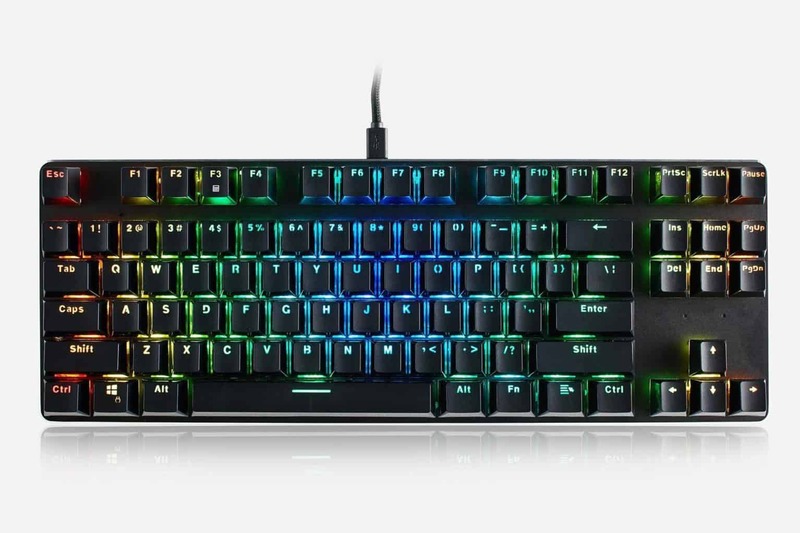 ‘This is the last keyboard you will ever need to buy‘ is what it says on Glorious’ website, and judging by the build quality that might just be true. The keys sit right on top of an aluminum faceplate, which makes the keyboard feel super sturdy; I couldn’t get it to bend or even make a slight noise. The rest of the keyboard is made out of a hard plastic, but it all feels really good. I was thoroughly impressed with the overall build quality of this product. The included keycaps feel great and high quality, but the font on them isn’t really my kind of thing. Some letters or symbols seemed like they’re missing parts and the overall font choice isn’t something I’d go for, but that’s a personal thing of course. As is customary with gaming gear you gotta have that RGB show, so the GMMK features fully customizable RGB backlighting as well. The Glorious Modular Mechanical Keyboard comes with one of those thin plastic covers. I always use those when I’m away from my keyboard for a day or more, so it’s nice that Glorious includes that in the package. Inside the box you’ll also find an instruction manual (and an extra one explaining how to replace the switches), a couple of spare rubber feet, a keycap puller and a pretty nicely done Glorious PC Gaming Race sticker. There’s also a neutral escape button keycap in there, in case you don’t like the included ascend button. On the bottom of the keyboard itself you’ll find the keycap puller. Included keycap pullers are always nice, and the keycap puller holder is a simple but very effective and much appreciated inclusion. You’ll never be stranded without a puller with this keyboard. 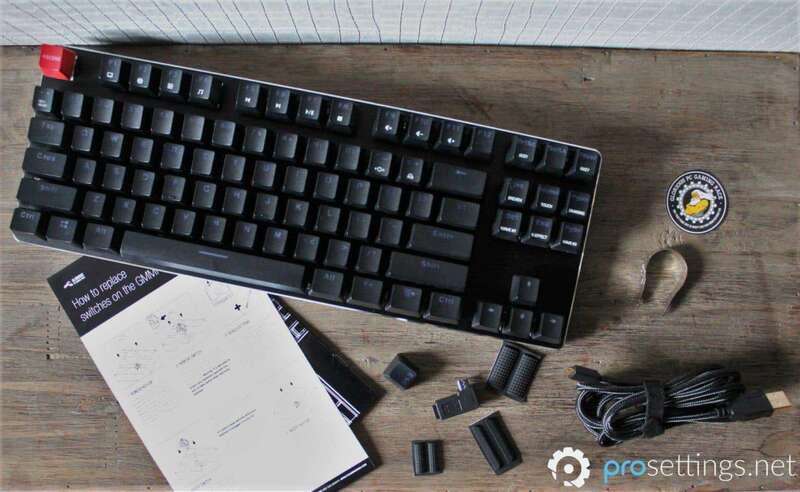 The GMMK comes in two versions: tenkeyless (TKL) and a full sized version. I tested the TKL which, to me, is the ideal middle ground between compact sizing and still having a bunch of features, but that’s obviously going to be a personal thing. Standard ‘extra’ functions such as media controls and so forth are accessible by pushing the FN key in combination with another key, with the alternate functions of the keys clearly printed on the bottom of the keycaps themselves. 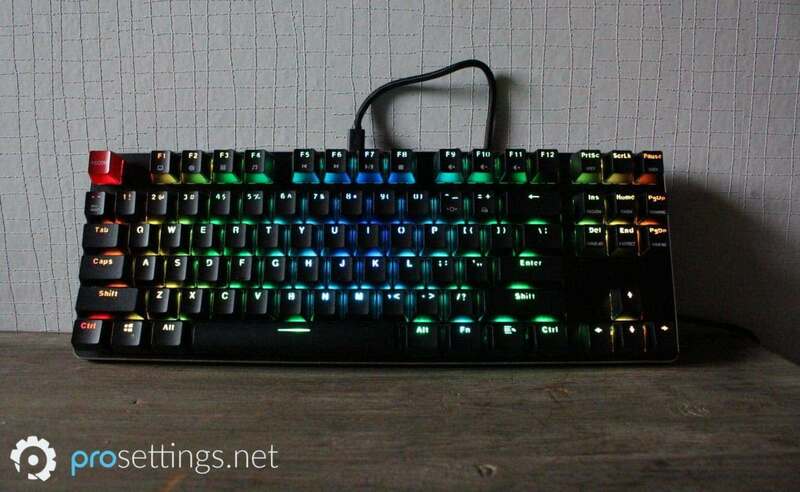 The FN key also controls the RGB lighting via the board itself, but there is the ability to download Glorious’ software, which will allow you to record macros or finetune the RGB lighting. Speaking of which: the RGB lighting feels kind of lackluster on this keyboard. I don’t want to get into it too much, because RGB lighting isn’t important for ingame performance and it’s not like the lighting is bad or anything, but it is one factor where the GMMK is clearly behind most of its competitors. That might have something to do with the keycaps being pretty thick (which isn’t a bad thing, let that be clear) and not allowing a lot of light to pass through them, but I didn’t really look into it any further since RGB lighting isn’t important for gaming at all, and Glorious state on their website that they’re more of the ‘function over flash’ kind of company. That’s fine by me. Back to more important factors then: performance. 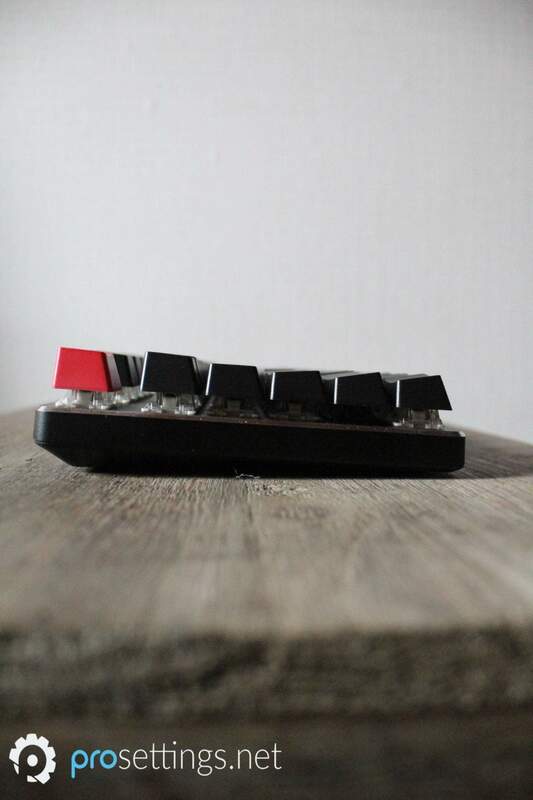 The GMMK has full n-key (NKRO) rollover, meaning that you can theoretically hold every key at once without any ghosting or stuttering. I’m always happy when I see NKRO on a keyboard. I rarely push more than three keys at once but it’s a sort of testament to how the designers really put performance high on their list. Obviously the most eye-catching aspect of this keyboard is the fact that you can just hot-swap the switches. A pack of switches (you can choose between Gateron and Kailh on Glorious’ website, but Cherry MX will also fit) costs significantly less than a completely new keyboard, so if you ever decide that you want to switch over to something different you can just order a set of new switches and go to town. 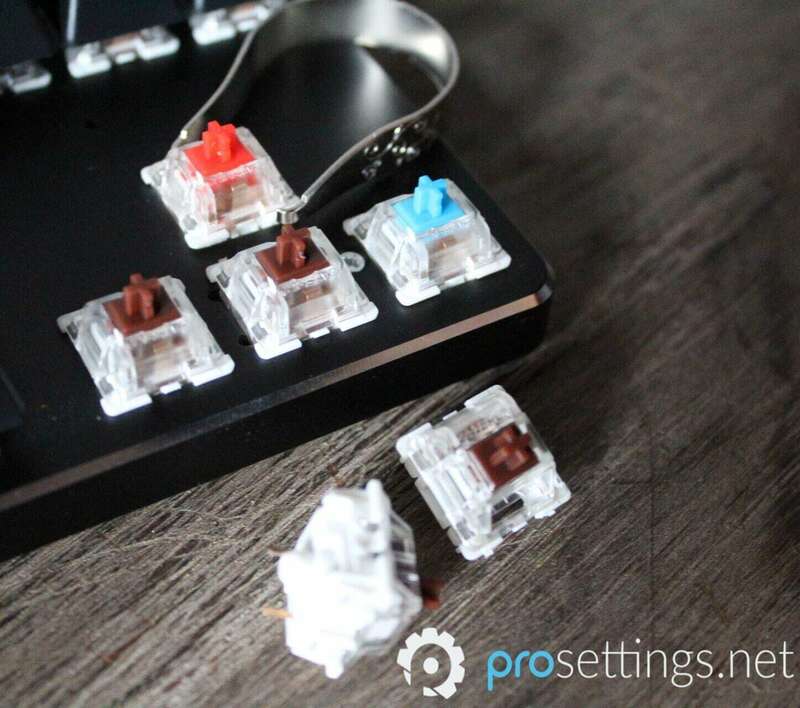 It’s not difficult to switch ’em out either, the switches come out easily with the included switch puller and then it’s just a matter of plugging in the new switch and adding the keycap. This modular aspect of the GMMK is everything but a gimmick, by the way. Having the ability to change the switches on your board (and with it the entire typing/gaming experience) in less than half an hour is great in itself, but the modular aspect also allows you to have different switches on the keys you most often use for gaming, for example. The possibilities are endless, and the customizable aspect is implemented really nicely, so even people who are completely tech illiterate will find this process easy. The GMMK comes pre-built with Gateron Browns, but you can also order a completely empty board and choose your own switches and keycaps. I tested this board with the Browns (I also got a switch sample pack so I could test out how easy it is to replace switches) and I really liked the way it typed. Some of the larger keys on stabilizers rattle a bit when typing (for me mostly the backspace key) but it’s really not noticeable enough to be annoying. The keyboard features standard Cherry style stabilizers, in case you’re wondering. The switches themselves are a little loud (there’s an audio sample where I’m typing this very sentence in the sound clip to the right) but that’s just the nature of the switches; the keyboard had a lot less volume when I tried some more discrete ones. In case you’re wondering: the Gateron Browns are easily as good as their Cherry counterparts; I’d even dare to say that the Gaterons feel a bit smoother and have a slightly more noticeable bump, but that could just be me. 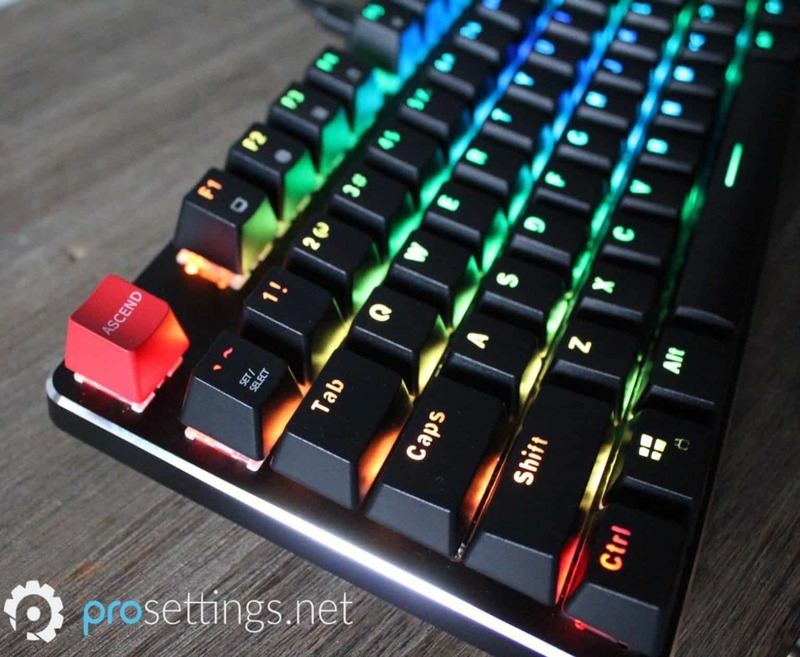 We’re obviously a website dedicated to gaming, so I tested the keyboard in a bunch of games (Overwatch, Battlefield V, AC: Odyssey, …) and it performed without any hiccups, which admittedly is to be expected of any decent mechanical keyboard. Browns aren’t really my preferred switch for gaming, but that’s completely subjective so I’m not saying that as if it’s a bad thing. There’s also something to be said for having that tactile bump for when you have to make precise movements, so it’s not like I felt limited by the ‘default’ switches on this board. As with any new keyboard I get I also did a bunch of online typing tests with it. Those tests don’t really mean anything, but if you’re noticeably slower on a certain keyboard even after getting used to it then that’s an indication that the keyboard isn’t for you. Luckily I didn’t have any issues with this one. I even managed to be a bit faster than my regular typing speed on some of the tests, so there’s that. Throughout my testing I also encountered a pretty unexpected pro of this keyboard, and that’s the raised keys. I really don’t like filthy peripherals and once I find a hair or something like that stuck between the switches of my keyboard it tends to drive me crazy. The fact that the switches on the GMMK are just sitting on top of the keyboard makes it an absolute breeze to clean and maintain, which is something that I personally really appreciated. I would have liked to see a USB passthrough port, however. It’s not a must per se, definitely not on a TKL model, but the full sized version also doesn’t have it as far as I can tell, and that’s a small downside in my opinion. The people over at Glorious have set out on a difficult mission; they aim to ‘create unique gaming accessories, engineered for premium quality and elite-level performance, sold at everyman prices.‘ That’s a bold statement, but I really do feel like they’re on the right path with the GMMK series. At the surface the GMMK is ‘just’ a really solidly built and reliable keyboard, with a sleek and non-intrusive design, but the fact that they’ve added the modular aspect to it elevates the keyboard to a higher level, in my opinion. Buy the GMMK and two sets of switches and you essentially have two completely different keyboards at a fraction of the cost of two actual keyboards. Switching up the switches really is as easy as one-two-three as well, so you don’t have to be a tech expert to change it up. The typing experience is solid, it’s got a high quality detachable cable, and the raised keys are a major plus for me. Little extra things such as the keycap puller holder also serve to show that Glorious paid attention when they were designing this board. 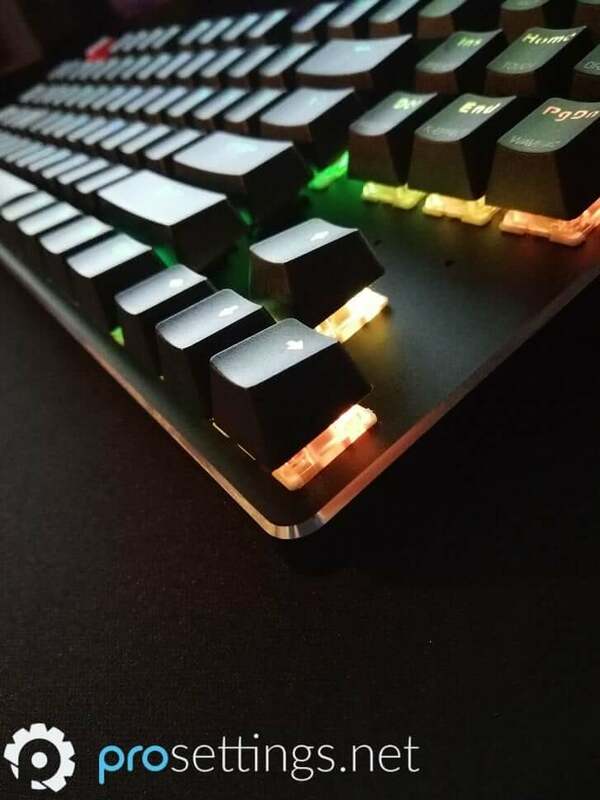 The only real letdown of this keyboard is the fact that the RGB lighting isn’t up to par with its peers, but that’s not really something that concerns me personally. There’s also no USB passthrough port on either model, in case that’s something that floats your boat. Concluding: the GMMK is a really nice keyboard which would admittedly not be very remarkable on its own, but Glorious have managed to raise the stakes by making it modular. If that’s something that interests you or you haven’t really settled on a ‘permanent switch type’ then you should definitely check this one out. how are the stabilizers on the keyboard? They’re standard CherryMX style stabilizers. They’re a bit rattly on some keys though. I personally don’t mind it all that much and a bit of lube will certainly fix the issue for most people I’d say, but your mileage may vary of course.